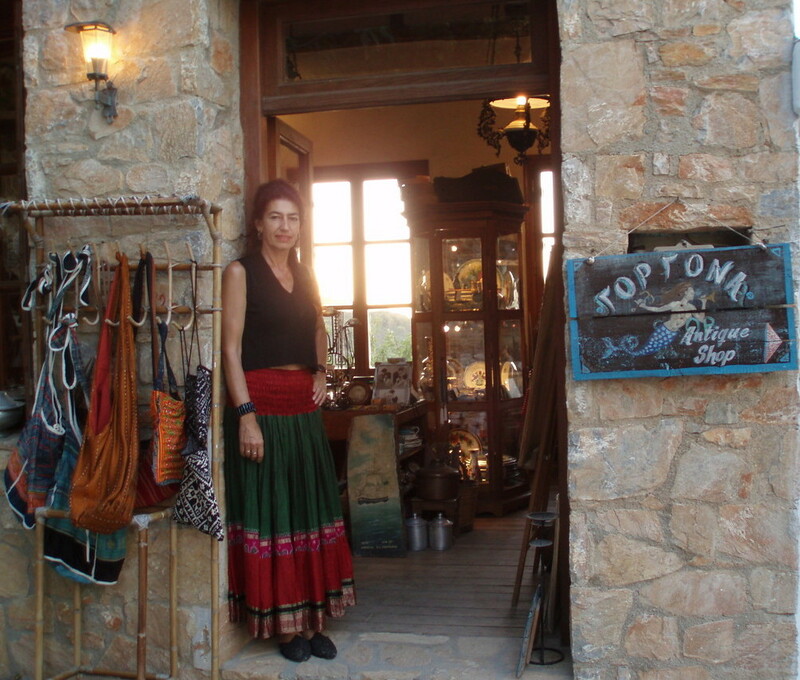 The story of Gorgona Antique Shop begins in 1978, when Elma first visited Alonissos and fell under the spell of the island’s natural beauty. She felt inspired by the unique charm of the Old Village with its traditional architecture and decided to live her dream by opening the first shop in the Village. 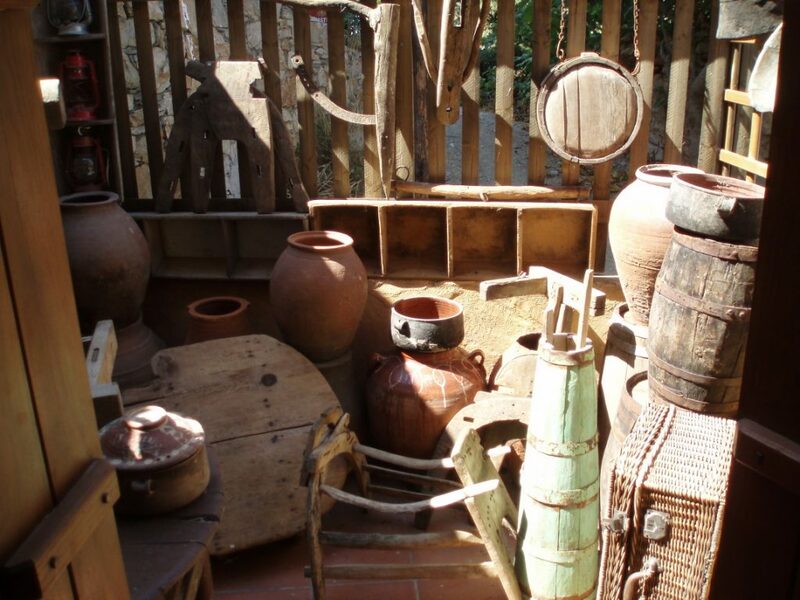 In those days, the rare visitors to the semi-ruined Village, where electricity had not yet been installed, were amazed to find kilims, woven rugs, lace, vintage clothes and old-style terra cotta pots in Gorgona Antique Shop. The shop at the time was housed in a traditional two-storey house, decorated with colourful Greek woven textiles, embroidery and porcelain dishes, resembling a folk-museum. 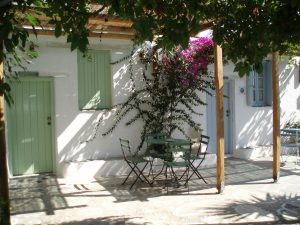 Today, this very same building has been transformed into two authentically refurbished homes to let, in Elma’s traditional style (Elma’s Houses), while the antique shop has moved to a central position in the Village itself. Elma’s love for antiques stems from her studies in the Architectural School of Florence. She acquired her knowledge of art and appreciation of traditional, handmade and authentic objects made by anonymous artists and craftsmen of another era during her stay in Italy. Elma’s passion for building up her stock of antiques and vintage goods started out as a hobby, allowing her to combine it with her other interest, jewellery-making. In Gorgona Antique Shop you will find unique items of handmade jewellery as well as old books, engravings, vinyl, gramophones and antique cameras. Elma’s travels took her to far-flung places, allowing her to broaden her cultural horizons, and this in turn is reflected in her shop with its great variety of different objects, each of which has a story of its own to tell. Antique oil lamps and chandeliers decorate the interior of the shop, while old copper kitchen utensils, antique chests, amphorae and agricultural implements all serve to remind one of past traditions and cultures, giving a colourful and vivid impression of a bygone age. On a more modern note, the Antique Shop even boasts a unique example of a table-top pinball machine from the 1950’s ! Since 1997 Gorgona Antique Shop has been housed in a 3-storey building featuring traditional architectural elements, specifically designed and built by Elma to showcase her unusual and unique collections. Visiting Gorgona (which in Greek means ‘mermaid’) today is like a trip into Aladdin’s Cave, full of marvellous treasures, providing the visitor with a nostalgic and romantic sense of time-travel. Visitors can make a voyage of discovery through time and explore a life-story. Only with patience and persistance, know-how and a true sense of taking pleasure in work well done, but mainly with the help and support of all the members of her family, can the authentic magic of Gorgona be maintained intact over the passage of time. A browse in Gorgona Antique Shop and a chat with Elma herself, whether in Greek, English, French or Italian, should be enough to win you over. Among the thousands of visitors who enjoyed a few moments in Gorgona Antique Shop we are proud to name Robert de Niro, who bought a handmade Panama hat in the shop in 2012 !